“It’s liminal also,” I offered. As we contemplate the quotidian, we might recall that it was on this date in 1924 that the Marx Brother’s took Broadway by storm. Already vaudeville stars, they’d wrangled a spot on the Great White Way, a last-minute opening for which they threw together a review based nominally on an unsuccessful musical comedy by Will and Tom Johnstone, originally written for British actress Kitty Gordon as Love For Sale. The Marx Brothers substituted in some of their most trustworthy material and called it I’ll Say She Is. 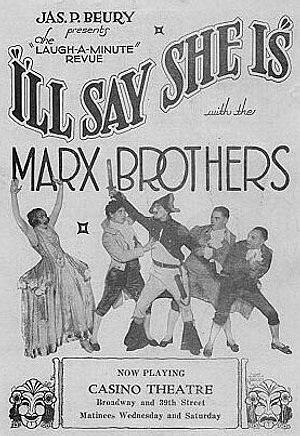 In one of show business’ great strokes of luck, the opening night of a major dramatic play, slated for this same date, was canceled, leading all of New York’s leading critics instead to the premiere of the relatively-unknown Marx Brothers’ show. Their extraordinary banter and slapstick astounded the critics, and put the Brothers on the road to Broadway, then Hollywood fame.